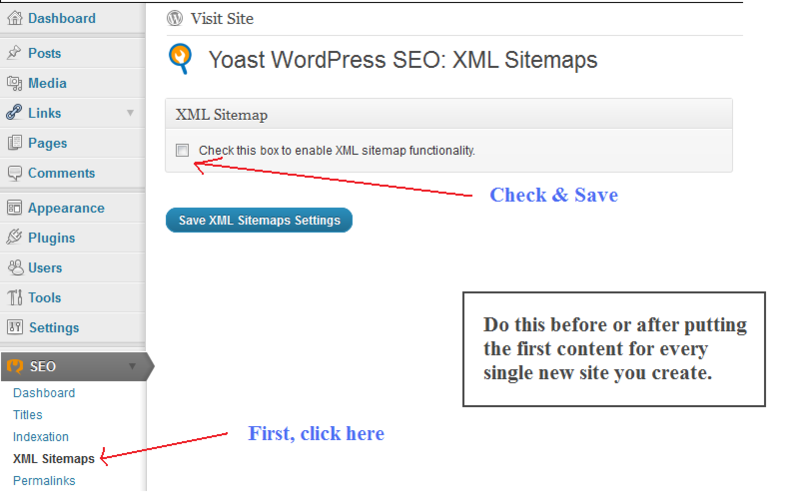 If you already installed WordPress XML Sitemap, you might skip the step 1. I recommend using Google XML sitemap or WordPress SEO by Yoast. Step 2. Go to your Google Webmaster account Task: Add your site and verify it with a meta tag provided.You can choose either simply insert the meta tag or upload meta tag using html through FTP uploader.For easy and learn more download the SEO Optimization-Starter-Guide.pdf Google will approve or not approve the Sitemap in about Ten to Twenty Minutes. Normally, within seven to ten days Google-Bot will index your site. Tips: Set up an account on iGoogle and on My Yahoo. For each, set up a blog reader. Next, go to Blogger and set up a private blog. Step 3. Every day, add a short description on one of your pages to the blog with a live html link. Post on your blog, then go to Pingomatic.com, and ping your latest blog post. About 30 mins later, open you post through iGoogle and Yahoo readers, and click on the link. Step 4: Another important step, go to Social Bookmarking This is absolutely irresistible spider bait! For a reason, the Social Bookmarking sometimes is difficult for submitting your URL. When you are at Socialmarker site, look at “Select the social bookmarking sites you want to submit to”-Click “best”, you’ll see 15 best bookmarking sites as ticked. Submit to all of this site manually. Be patient, it worth all your valuable time when you saw your rank increase drastically. Generate traffics is easy. However, generate traffics that convert could scratch your head so hard. What good is it if you are the only one reading your website? 1).Please open the www.reddit.com address in your Internet browser and click “Submit a link” button on right side. Enter symbols which are under the “are you human?” question and click the “submit” button. Important Note: Don’t miss your submission to Google.Google dominates the Search Engines 65%.Yahoo and MSN to 28%.’ Hence, you would be insane to miss such a big player. Enter symbols which are under the word “Optional” and click the “Add URL” button. Open the www.bing.com/webmaster/SubmitSitePage.aspx address and enter symbols on an image to the “Characters” box. Then enter Your website URL in the “Type the URL of your homepage” box.Then click the “Submit URL” button. Enter your email address in the “Email Address” box. It must be valid email address because you will receive a confirmation email and you will need to confirm your submission from within this email. Enter your email address in the “Email Address” box. 6).Another search engine is Cuil. Open web page: www.cuil.com/info/contact_us/feedback/crawl_me and enter your email address in the “Your Email” box. Enter: Your website URL in the “Site URL” box. Click the “Send” button. Then, enter Your website URL in the “URL of suggested website” box. In the “Please describe the suggested site” box enter: Few sentences of your site content. Click the “Send” button. The following are killer steps for indexing your website. Get Google Analytics and put Analytics code into your website. Alternatively, some themes designed to integrate Google Analytics. Verify your website with Google Webmaster tools. Login to Google Webmaster, the verification is so much easy after you performed the first step. Up to this point, I don’t see any problem your site not to be indexed by Search Engines. Follow here to read more. Submit new URL at a click. How quickly will Google ads start appearing on my site? After you’ve been accepted into the program and have implemented the HTML ad code on your site, ads will start running within minutes. If your site is not yet in our index, it may take up to 48 hours or more before we are able to crawl your site. Until your site has been crawled, we may display public service ads, for which you will not receive earnings. Source: Speed of Google’s ads. >>> Updated as at March 03, 2015. A Free And Friendly On Page Optimization Tutorial – Yoast Plugin. our domain URL or title and generate with the following Meta Tag, It might suggest you the right Meta Tag keywords for your site. Then, get proceed to add into Free Meta Tag Generator for detail of your Meta Tag title, the author, and copyright of the owner. Google Analytics and Google Adsense together are a very bad combination. You’re giving Google a lot of data. You might be showing them precisely how much your website is earning and precisely how much traffic your website gets and from where the actual quickly the traffic is increasing. Google does watch our accounts, accounts, especially on our Adsense accounts. When there is a spike in revenue, or you hit a revenue level that Google saw’s as significant, they are going to perform a manual overview of your website. Regardless of how careful you might be, making improvements you believe you’ve done nothing wrong whatsoever, Google will protect their brand when they even suspect for any second that you will be gaming their results. So besides ensuring the websites, you create have great content and provide a great user experience, so what can do? The very first things you can do is move away from some control from Google and the simplest way to achieve that is by using another analytics program and luckily for all of us, there are several excellent alternatives. For many my sites thing client sites, I no more use Google Analytics, and that I usually do not use Google Webmaster tools.